The Pensions Regulator is the UK regulator of work-based pension schemes responsible for ensuring employers comply with the new Automatic Enrolment of Workplace Pensions legislation. Over the coming months, they’ll be writing to more than 1.5 million addresses to make sure that all employers know what their ‘Staging Date’ is by the summer. The majority of employers will receive the standard letter below. 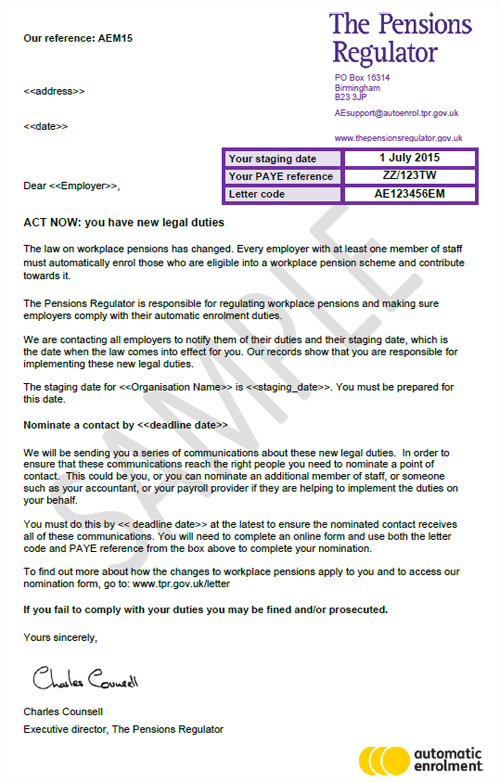 (An alternative letter will be sent to single director companies whose PAYE data, as of 1 April 2012, showed that they had workers being paid at that time, but The Pensions Regulator records indicate that this is no longer the case or that they are only paying themselves as the director). The first step for any business is to find out what their ‘Staging Date’ is. This is the date that your business will have to start complying with the new legislation. Businesses with 30 employees or fewer will start to be phased in from 1st June. 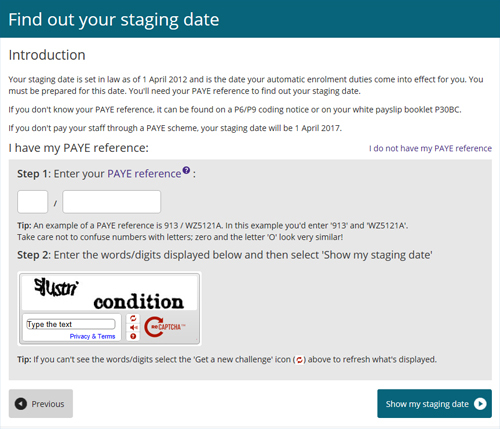 To find out what your date is, go to The Pensions Regulator Staging Date Tool and enter your PAYE reference number. Once you have your Staging Date, login to Sage One Payroll and enter it in the ‘Auto Enrolment / Pensions’ box on the ‘Payroll Summary’ page. You’ll then see a handy countdown showing you how long you have left to get prepared in months and days. If you don’t already use Sage One Payroll, sign up for a free 30 day trial and then download our free ‘Sage One Guide to Automatic Enrolment‘ to see how easy it is to get prepared.